NOTE: Click on tables to expand. 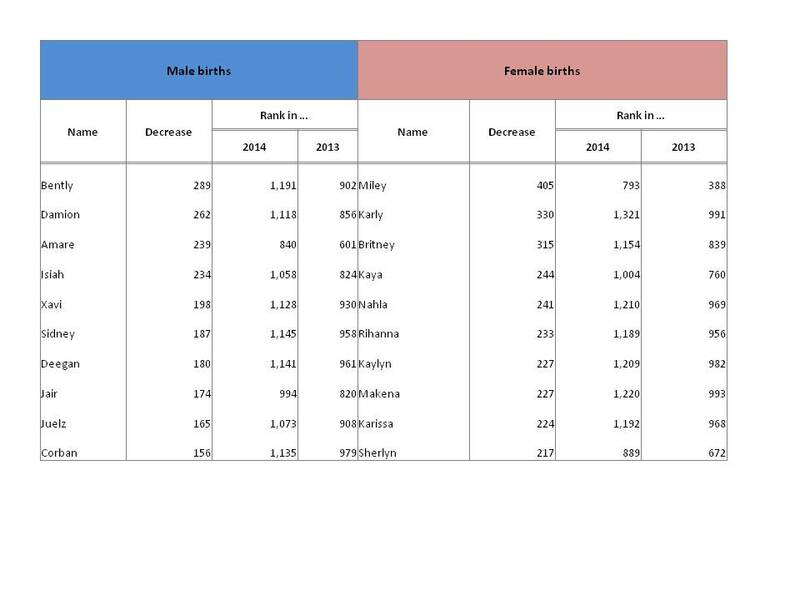 The Social Security Administration has been releasing the most requested baby names, based on requests for Social Security numbers for newborns, since 1997. 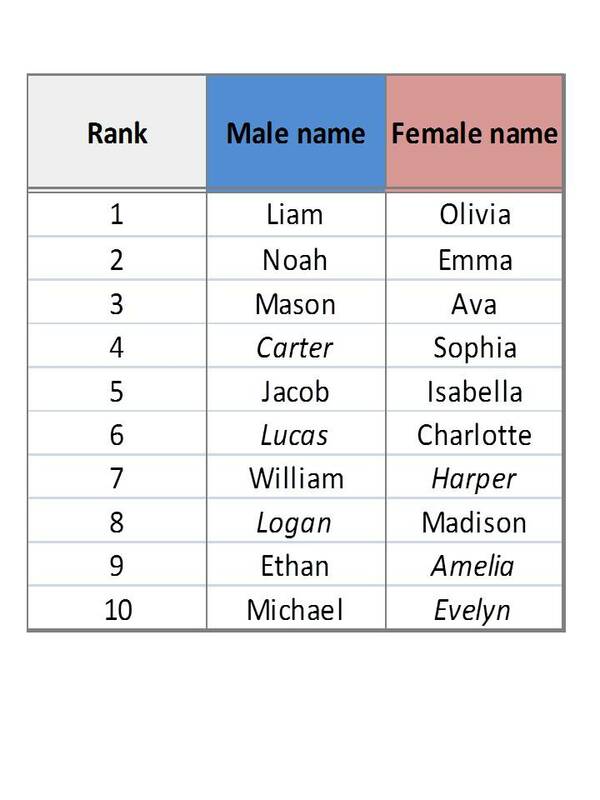 They reveal the top 10 names for boys and girls each year, and their records date back to the 1880s. 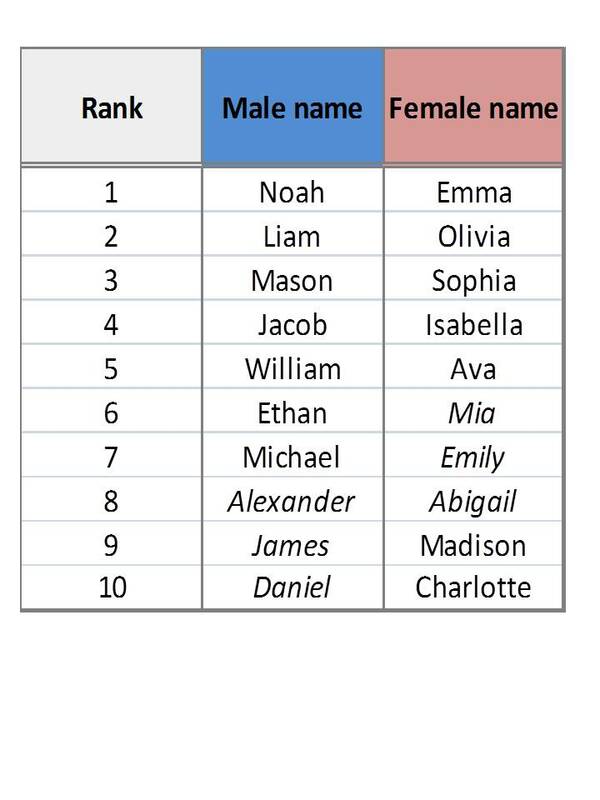 What makes a baby name popular is hard to pin down. Trends in new baby names often follow popular culture, influenced by favorite characters in books or movies, as well as religious meanings. Whether a movie star or your beloved grandmother inspires the choice for the name you give your child, know that Social Security is here for them, and you, through all life’s challenges. In fact, you may already be hearing them since Noah rose from number 4 in 2012 to first place in 2013, and Emma was in second place in both 2012 and 2013. Anyone who knows me recognizes that I LOVE DATA, and rankings (if done correctly) are the most interesting data you can find. Here are the Top 10 names in 2014 for both Boys and Girls. Michigan did not drift too far from the national average, though both of the national winners fell to second place. In addition, we differed from the nation in three of the other eight cases for both males and females. Carter showed the greatest strength among the unique leaders for Michigan, coming in 4th, followed by Lucas (6th) and Logan (8th). On the female side of the ledger, Michigan provided Harper (7th), Amelia (9th) and Evelyn (10th). While it is interesting to see who the winners are each year, the real study of popular culture is embodied by the names that are MOVING UP and MOVING DOWN the charts. Let’s start with the big winners from 2013 to 2014. I must admit that I am having a problem understanding why any of these names took off in 2014. Bode Miller, the skier, hasn’t done much of late, nor has Axl Rose. The Coen Brothers are still making films, but nothing big. Is Anakin Skywalker rising in anticipation of a new Star Wars movie, and are Irish births rising such that Killian was big last year? I am truly at a loss for female names. Montserrat and Monserrat??? Some of the others sound like they came out of Game of Thrones, but Khaleesi, which fell just out of the running, is the only one I can identify. How about the 2014 losers? This time the male names provide me with no clues, while the female names are heavily populated with singers/entertainers that must be experiencing large losses in record sales – even though I thought Miley, the biggest loser, was still doing quite well. I suppose parents were no longer interested in having their little girls associated with twerking. I don’t plan on giving you an excruciatingly long diatribe on trends (though I REALLY love trends! ), but I have to give you a couple of personal facts. When I was born, the name “Kurt,” spelled with a “K,” ranked 297th. Its popularity increased to 160 during the 1950s, and to its highest point of 121 during the 1960s. It fell to 180 during the 1970s and then out of the Top 200 by the 1980s. Its most recent rankings ranged from 610th in 2000 to 961st in 2005. Alas, I have been off the charts (out of the Top 1,000) since 2006. My wife and I never realized how ahead of the times we were when we named our first child Noah in 1980. While I didn’t realize it at the time, his name ranked just 240th among all boys born that year. Popularity of the name was to take well over a decade. By 1985 he was up to 217th, but fell back to 228th in 1990. By 1995 Noah had barely broken into the Top 100 with a rank of 99th, but that was the beginning of his meteoric rise that has kept him in the Top 10 since 2009. Our daughter was born in 1983 and we named her Leah (we have this thing about 4-letter first names – my wife is Jody – that have a Hebrew touch). She started higher on the list than her brother, with a rank of 82nd. This rank held steady in 1990, but fell to her lowest point of 103rd by 1995. She regained her Top 100 position of 96th by 2000 and rose as high as 24th in 2010. Alas, she was not able to attain her brother’s rank, falling back to 35th in 2014. She made up for that by having twin daughters in 2014, adding to another daughter born in 2011, named Claire (ranked 50th). Where do you rank – now and when you were born? I know you will have fun exploring.